This large wall bowl is from the End Of Day® series, meaning it is made with a variety of colors used throughout the day. The colors are very bright and vivid, and contain many colors of the rainbow. This wall bowl also has real gold adventurine added so make sure to zoom in to see that extra gold sparkle. The more light you shine on it... the more it will sparkle! This bowl was also made using a scalloped technique which adds optical depth that enhances the 3D when staring at the center of the bowl. 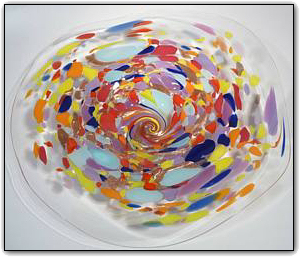 It can either be hung on a wall just like a picture, or it can be set out as a table platter. To hang the bowl on a wall, all you need is a secure hook on the wall and a hanging apparatus comes along with the bowl. Hanging the bowl is a breeze and should take less than 10 minutes. You won't believe the compliments you are sure to receive when displaying this gorgeously colorful wall bowl!